The community of Pointe du Chene (Oak Point) no longer has Oak trees, which were used to make masts for ships but Pointe du Chene has quite an history. The original inhabitants of the land were Micmac peoples who travelled the river systems to trade with others, cultivated crops, hunted in the forests, and fed from the resources in the rivers and bay. The Pointe du Chene area was rich in bar clams, razor clams and other seafood. The first settlers arrived in the late 1700s and by 1860 timber and shipbuilding led the economy for this community. The history of Pointe du Chene is closely linked to it's wharf. The wharf had been built in the 1840s to support a ferry for PEI. The wharf became a loading point for material shipped up the Saint Lawrence River and Nova Scotia. A bit later, in 1857, the European & N.A. Railway provided service between Pointe-du-Chêne and Saint John NB. This railway , originally built between Saint John and Point du Chene, is the original rail line of the Canadian National Railways family in New Brunswick. A significant workforce was employed at the Pointe du Chene wharf and at the railway company dock. The original 16.8 miles between Shediac and Moncton was opened to the public in August 1857. While the line from Shediac to Moncton was came first it was extended further to Point du Chene and its wharf. Originally the line was supposed to go from Cape Brule to Saint John. However, Cape Brule did not have a good harbour and Pointe du Chene was selected. In those days, Pointe du Chene was an important commercial area because of the railway and ferry. A bit after the first world war the ferry terminal was moved to Cape Borden-Tormentine and with the arrival of automobiles truck transport slowly replaced the railway. Today trains don't even make it to the wharf anymore and the tracks have been removed. In the past the train ran from Moncton to Pointe du Chene during the summer months. Families would jump on the train and come up for a day at the beach. The history of Pointe du Chene is definitely closely linked to transportation. In 1857 the second railway line in the Maritime Provinces connected Pointe-du-Chêne, Moncton and Saint John. In 1858 the first ferry service to Summerside PEI was established. In 1927 the first transatlantic hydroplane flight from Europe to North America landed in the Shediac Bay . In July 1933, an air fleet commanded by the Italian General Italo Balbo crossed the Atlantic and landed in the Shediac /Pointe-du-Chene Harbour. 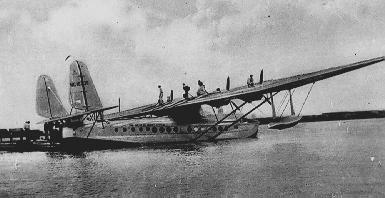 It was at the Pointe du Chêne wharf that Pan American Airways established a seaplane base in 1937. The plans landed in Pointe du Chene for refueling the "Flying Boat" with onboard such celebrities as Greta Garbo, Bob Hope and Edward G. Robinson, as well as Queen Wilhemina of the Netherlands. . It was from also form this area that Canada's first airmail letter to Britain was sent in 1939. The Pointe du Chene wharf was instrumental in the fishing industry, exportation of potatoes and forestry.